CorpRat Pty Ltd is one of the fastest growing business publishing and training organisations. The company publishes products, programs and training courses targeted to both business and coaching/consultancy sectors. The main areas of specialisation include business development, lead generation, marketing, performance coaching, balanced scorecard and profit improvement tools. 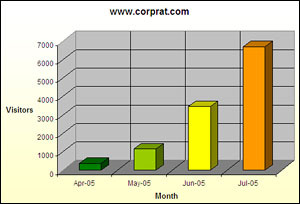 Prior to providing search engine optimization for CorpRat, its web site received about 10 visitors per day and their main online marketing strategy was advertising through the Pay-Per-Click bidding on Google and Yahoo. They spent over $2,000 per month on PPC and the sales conversion was very poor. Having been impressed by Apex Pacific�s technology and detailed Search Engine Compatibility analysis of the site, Peter Hickey (the Managing Director of CorpRat) asked us to provide a search engine marketing solution to ensure their site would rank well for regional business coaching-related searches in their target market in Australia. Our first step was to conduct keyword research into the topic of business coaching to produce a range of targeted keywords and phrases that would attract the most relevant traffic to the site. This was followed by an overhaul of existing Title and META Tags on each page, followed by extensive page copywriting to integrate new targeted keywords naturally into the site, and link building strategy to increase their Google Page Rank. Now, CorpRat�s web site attracts 200 quality visitors per day (increase by 2000%) and they have reduced their PPC spending to $500.00 per month. "With the continuing search engine optimization support from Apex, we will achieve more top rankings for our targeted keywords, we will likely stop our PPC campaign within 2 or 3 months when more visitors are coming to our web site from the free search ranking results", says Peter Hickey. Can Apex Pacific�s offer support and expertise on running a Successful SEO Campaign? Of course! Our experienced consulting team will be happy to develop an effective strategy, to help give your business a competitive advantage over your competition. Please contact us now. How much do you spend on PPC campaigns? Learn how to turn a non-productive website into a powerful revenue generating website with PPC Submission.